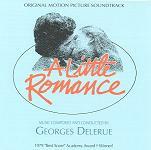 Georges Delerue is a composer who gained a vast amount of film composing experience over several decades. He studied at the Paris Conservatoire under Darius Milhaud and went on to score for French television programmes and documentary films before making the transition to cinema music. Relatively early in his career he established a partnership with director Francois Truffaut starting with "Shoot the Pianist" and "Jules et Jim", but continuing over an extended period. Similarly he worked several times with the director Philippe de Broca, with Gérard Oury on "Le Corniaud" (The Sucker) and "Le Cerveau" (The Brain) and with Jean-Luc Godard. Although the composer's prior experience was widely-based stylistically, from ballets and operas to those documentaries, many (though not all) of his early films were either comedies or satirical in nature, and Delerue's music of the period reflected this with a light touch and a whimsical tone - the French equivalent of the music of Nino Rota for Italian director Fellini. Nevertheles the world-wide reputation earned by these directors resulted in their films being dubbed into English and contributed to establishing the name of Georges Delerue among film-makers. Delerue then worked on a number of Hollywood productions, winning an oscar for "A Little Romance" and gaining nominations for "Ann of a Thousand Days", "The Day of the Dolphin", "Julia" and "Agnes of God". His music of the period became less European but retained its warm lyrical nature. His work in Hollywood tended to be for Romantic and Sentimental dramas, so those few films which show a darker more complex side seem surprising in contrast. As has happened with many other film composers, there are at least two instances where Delerue's music for a film was either largely or completely replaced and, perhaps coincidentally, they are not typical of the composer's romantic output. With "Platoon", Oliver Stone had used Barber's "Adagio for Strings" as his temporary or "temp track" and commissioned Delerue to compose music in this style. In the end Stone kept Barber's moving music and this rather overshadowed the remaining parts of Delerue's score. However the composer's original music was recorded and has been released on CD together with another of Delerue's wartime scores from 1986, "Salvador" - see links below. In the case of "Something Wicked This Way Comes" Delerue's music was completely replaced by an alternative from James Horner. A New Record Label specialising in Film Soundtracks has been launched in 2011 called "Music Box Records". 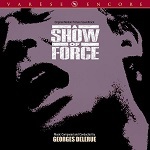 The New Label is based in France and their first release is the world premiere of two complete soundtracks by Georges Delerue. 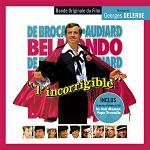 The first film is "L’Incorrigible" (The Incorrigible) directed by Philippe de Broca in 1975, and the second is "Va Voir Maman, Papa Travaille" (Your Turn, My Turn) directed by François Leterrier dating from 1978. The album is a limited edition of 1000 copies and its 63 minutes of music has been re-mastered, with 15 minutes of previously unreleased content. The label's web-site is at www.musicbox-records.com and is available in both English and French. 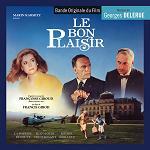 Another Georges Delerue soundtrack "Le Bon Plaisir" has also been announced for release in June 2011. To celebrate the music of composer Georges Delerue, here are some links to selected youtube videos. Firstly here are two videos with scenes and music from "The Woman Next Door" (La femme d'à côté) directed by Francois Truffaut and starring Gérard Depardieu and Fanny Ardant, though you should be warned that both videos contain major spoilers if you haven't seen the film. Here is a compilation of scenes from the film accompanied by Delerue's haunting and at times passionate string-led music, and here is the very moving final 5 minutes of the film. Secondly here is a series of stills from "To Kill a Priest". The film is directed by Agnieszka Holland, starring Christopher Lambert and Ed Harris, and set in Poland during the rise of Union Solidarity and its struggle for freedom. The song accompanying the video is The Many Crimes of Cain with lyrics and sung by Joan Baez and music by Delerue. Both films show a relationship with the composer Ennio Morricone with the long melodic line in "The Woman Next Door" and the collaboration with Joan Baez in "To Kill a Priest". Viva Maria - the movie with Brigitte Bardot and Jeanne Moreau stripping while singing "Marie, Marie"
To Kill a Priest - the main song is sung by Joan Baez who also sang the song on Morricone's "Sacco and Vanzetti"
Amelie - the film's main composer is Yann Tiersen yet there is are small snatches of Delerue's "Jules et Jim" and Barber's "Adagio for Strings"
There are a number of soundtrack albums available of music by Georges Delerue and if you want to gain an insight into his music, the following recommendations are a good place to start. There are other albums with Delerue collections but they can be hard to find. Truffaut & Delerue on the screen - an insight into the success of this partnership at www.amazon.com and www.amazon.co.uk, with music from "Confidentially Yours", "A Beautiful Girl Like Me", "Day for Night", "The Last Metro" and "The Woman Next Door"
For a more detailed biography, filmography and catalogue of works see the official Georges Delerue site at www.georges-delerue.com (in French and English).